It all started with a question. How can we improve learning outcomes for children living in remote villages with few trained teachers and textbooks, limited electricity and no Internet connectivity? 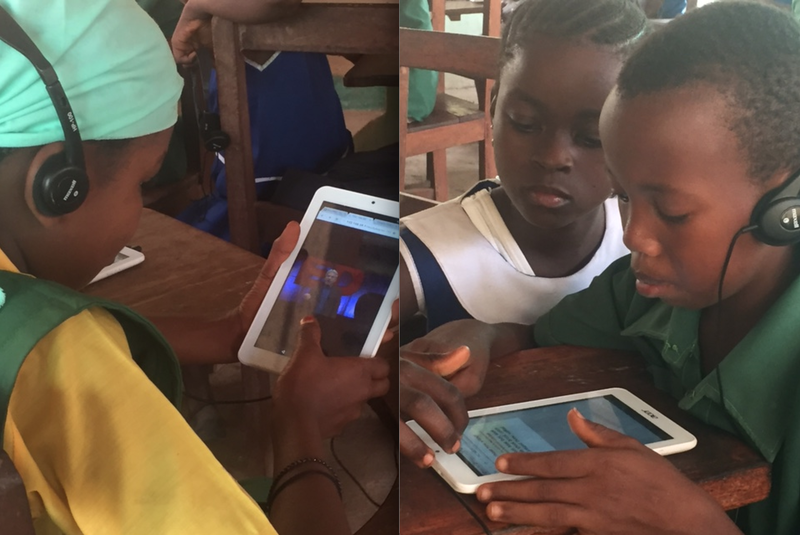 Five years later, after many hours of research, consultations with experts, and pro bono help from a large contingent of tech experts around the world, we have put together our first Mobile Learning Lab (MLL) to enable children to explore subjects of their own choosing, after school, through offline, interactive educational games, videos and tutorials. From the beginning, we intuitively felt that harnessing educational technology was the most effective way to improve learning outcomes for vulnerable children – and our research backed this up. Training enough teachers to meet demand, even at the primary level, could never happen quickly enough. The UNESCO Institute for Statistics (UIS) estimates that globally, 3.2 million new teachers will be needed (excluding attrition) to achieve universal primary education; 2.2 million of those are in sub-Saharan Africa. In Sierra Leone, one of the world’s poorest countries, this challenge seemed even more daunting. Currently, only half of children complete primary school, a mere 37% of children go on to secondary school and less than half of all adults over the age of 15 are literate. It would be hard to find a cohort of adults to train to become teachers. We had to find another way to improve learning outcomes and to encourage children to stay in school. Wanda Bedard, 60 million girls’ founder and president, visited Sierra Leone (traveling at her own expense) to deliver the first Mobile Learning Lab, a RACHEL (Remote Area Community Hotspot for Education and Learning) and 30 tablets, to our partner organization, CAUSE Canada. 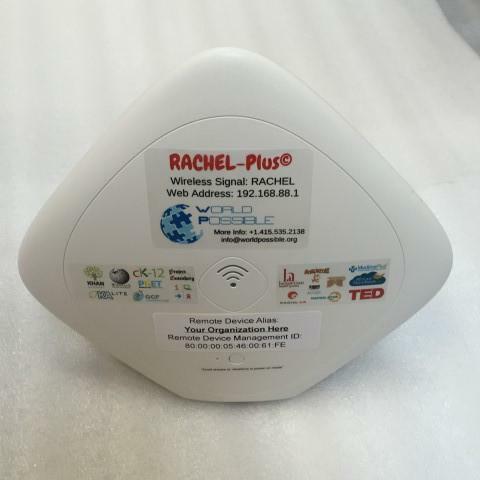 The RACHEL acts as a Wi-Fi server, and can connect up to 50 tablets simultaneously so children can access educational software such as Khan Academy and Fantastic Phonics, offline. It’s a small, easily transportable device, and costs under $500 US, a small investment for the scope of the impact. Khan Academy tutorials already came in an offline version called KA Lite , which we simply uploaded onto the RACHEL. We worked with eXplorance, a Montreal company, to create and add an offline version of Fantastic Phonics, an interactive literacy software, and CODE provided e-books with local stories. Plus, it’s all powered by solar energy. You can read about the details of the project HERE. Our project provided around 5,000 children with access to the Mobile Learning Labs. Our MLL is based on self-directed learning. This personalized education is the way learning occurs outside of the classroom, in the real world, and throughout life. We feel that this method not only makes sense, it is aligned with the education objective of the Global Goals to “ensure inclusive and equitable quality education and promote lifelong learning opportunities for all.” The children who need a little extra help have the tools at their disposal. And, those who want to advance their learning further are able to do so. The concept of self-directed learning is backed up by research that shows that children have an innate capacity to teach themselves. Sugata Mitra’s Hole in the Wall Project TED talk proved that children are curious and natural problem solvers. MIT’s Esther Duflo noted that remedial education, as well as computer-assisted learning, can be very effective as students can learn at their own pace. Furthermore, the success of Mass Open Online Courses (MOOCs) at the university level suggests that younger children could also benefit from this wave of access to open, license-free education. While MOOCs are online courses offered through universities, the RACHEL allows us to deliver educational materials offline to primary and secondary aged students in remote communities. It is our hope that the program will not only improve learning outcomes but also increase children’s intrinsic motivation to learn. Initial research suggests it will. The offline software we offer is fun. One of the main takeaways from our pilot project is that the children enjoyed the new learning tools; 86% of them kept returning to our initial learning centre and math scores improved. We know that the barriers to education for children in poor, rural communities are enormous, yet we feel that our mobile, after-school concept solves many problems inherent in reaching this population. As the children will access the labs after school hours, we don’t need to train more teachers. The materials are offered offline so children in remote villages without Internet connectivity can access the information. And, because the RACHEL is so small, it can be easily transported to a location with Internet access to upload more information or new software. This means that the educational software can be kept up to date. Furthermore, in times of crisis, the Mobile Learning Labs can go to the children. When Ebola hit Sierra Leone in the middle of our small pilot project and children were no longer able to go to school or gather in large groups, our partner was able to take the Lab to the children. For girls in remote communities, the stakes are even higher. They are among the least likely to go to school even though research shows that the longer a girl stays in school the less likely she is to marry young. Our project in Sierra Leone works with girl and boys (50/50) and includes a peer mentoring aspect so that girls have someone to look up to. Ultimately, our goal is to improve the quality of education to achieve higher learning outcomes and to foster children’s intrinsic motivation for learning. Education is crucial to development and leads to higher incomes for individuals, more economic growth nationally, better health, a stronger sense of gender equality, lower rates of child marriage, a better understanding of environmental issues, and higher rates of participation of women in the political process. 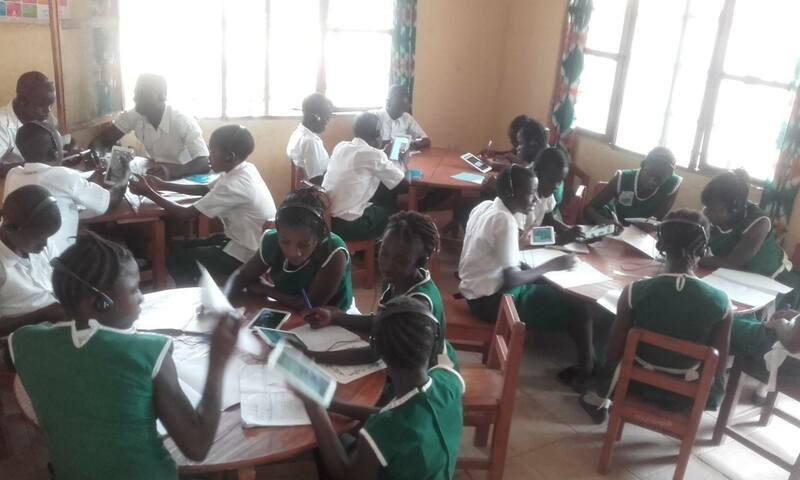 If the Mobile Learning Lab concept works in Sierra Leone, we feel that it will also translate to other countries, and other vulnerable populations. to improve learning outcomes for children around the world. You can keep up to date with our activities by following our blog and by following us on Facebook and Twitter.